“Oh, I’m mad for religious buildings. The only thing that really gives you a kick in the world is a religious building.” The inimitable Philip Johnson was quoted saying these words in the iconic book on the architect by Hilary Lewis and John O’Connor, Philip Johnson: The Architect in His Own Words. 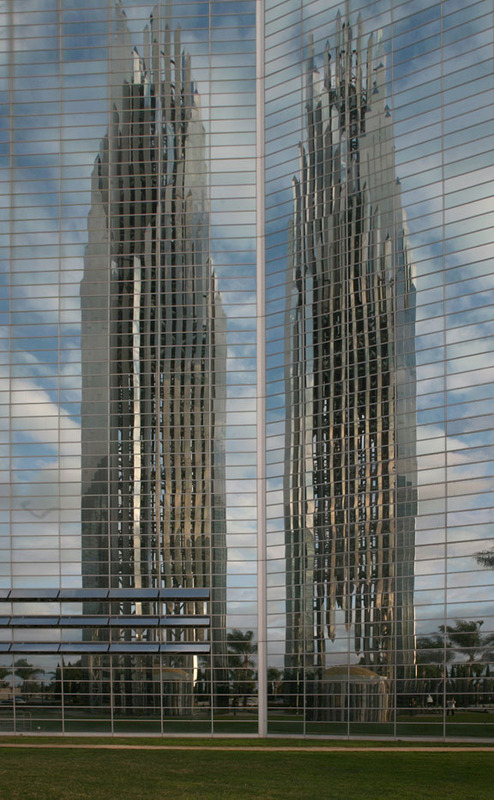 And what a "kick" the Crystal Cathedral and its surrounding buildings are! 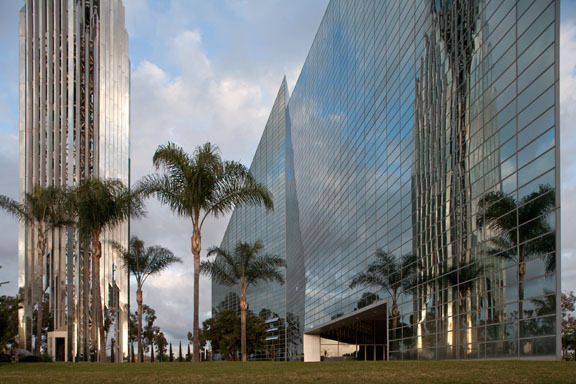 Playing off one another in syncopated rhythm, the Crystal Cathedral and its spire, by Johnson and Burgee; the Tower of Hope, by Richard Neutra; and the International Center for Possibility Thinking, by Richard Meier, all come together on the same religious campus and converse with one another amidst the incandescent sunshine of Southern California’s beatific climate. A stroll around these buildings can be an uplifting experience. 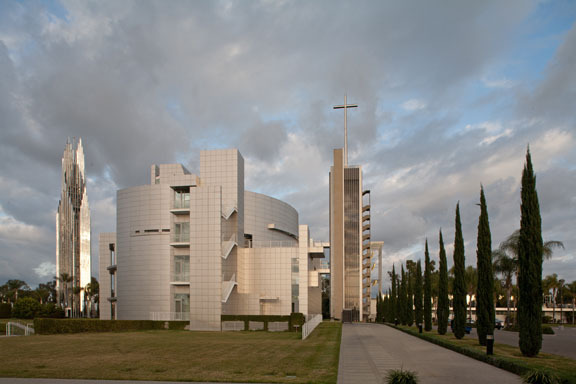 This was something of which the church's founder, Dr. Robert Schuller, was very aware, and his vision provided churchgoers with an architectural experience to go with their worship. 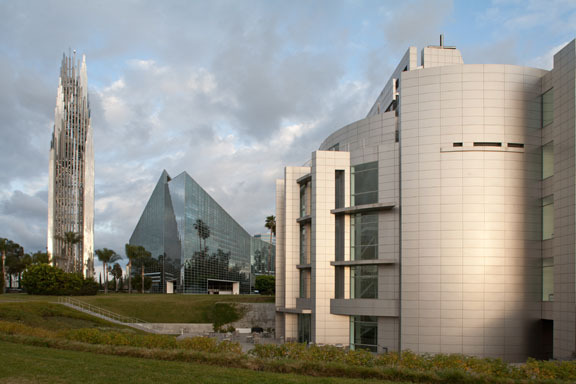 Dr. Schuller was also aware that his TV ministry would appear more grand and inspiring through the lenses of TV cameras with the dramatic backdrop of Johnson and Burgee’s 10,000 windows, the defining characteristic of the Crystal Cathedral. In 1977, Dr. Schuller became aware of Johnson through an article he read in TIME magazine, and he paid an unannounced visit to his office in New York. When Dr. Schuller arrived, Johnson was unavailable, so it was Burgee who met him – and he assumed that the unannounced visitor was looking for a job. Dr. Schuller assured Burgee that, in fact, he wasn’t looking for but was trying to give him a job (and what a job it was!). Johnson and Burgee designed a colossal megachurch measuring 415' by 207' and reaching a height of 128', with mammoth 90' doors opening onto the parking lot. Johnson called them his "Cape Canaveral doors." 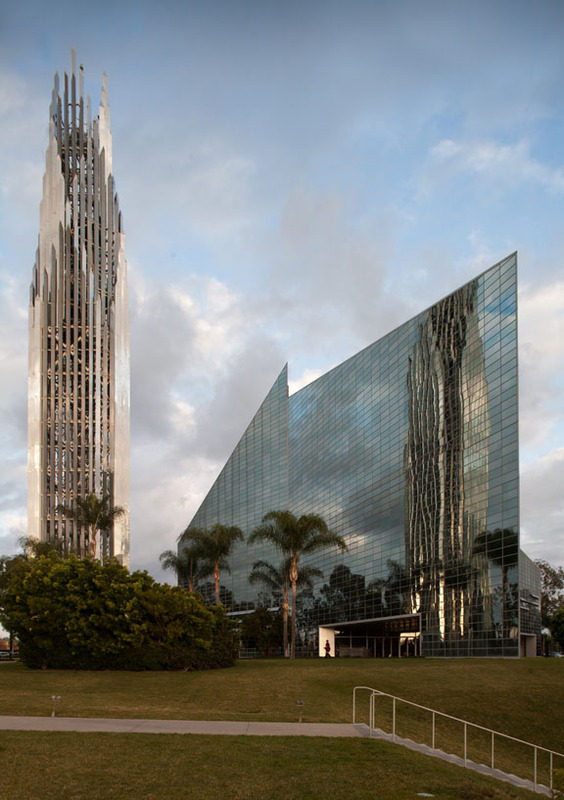 The Crystal Cathedral is in the shape of an elongated star, a motif Johnson took from German expressionism. Being much wider than it is long, the building provides the churchgoer with a much closer view of the altar than traditionally designed churches do. 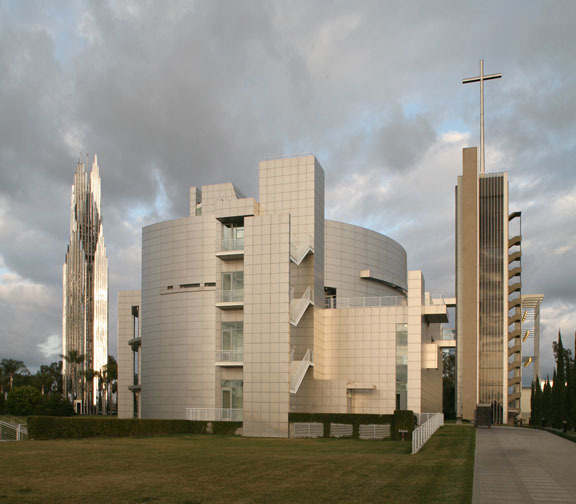 The unlikely combination of modern and post-modern architecture, together with a fervent evangelical Christian congregation, has given the Crystal Cathedral (officially known as the Garden Grove Community Church) a unique place in the history of religious architecture. 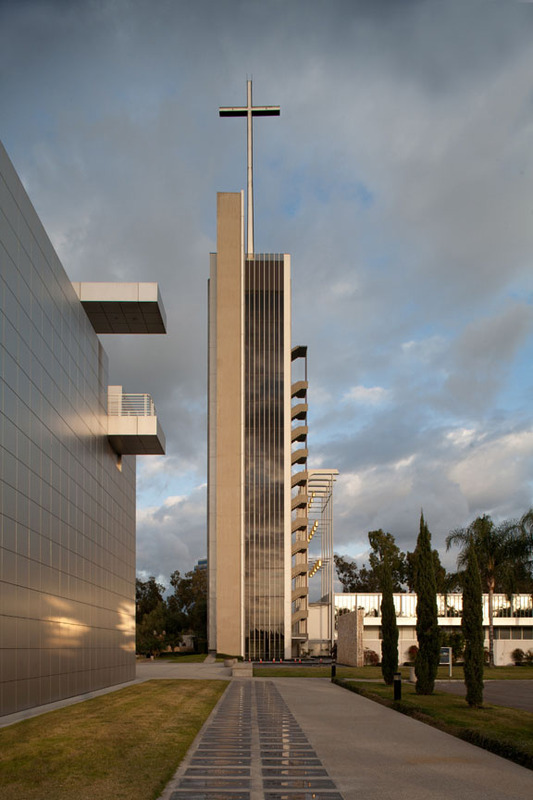 Johnson, Meier, and Neutra were (and, in the case of Meier, still are) all better known for their commercial, institutional, and residential projects, and their ingenuity and architectural sleight of hand have given the church campus a sophisticated spatial dimension. 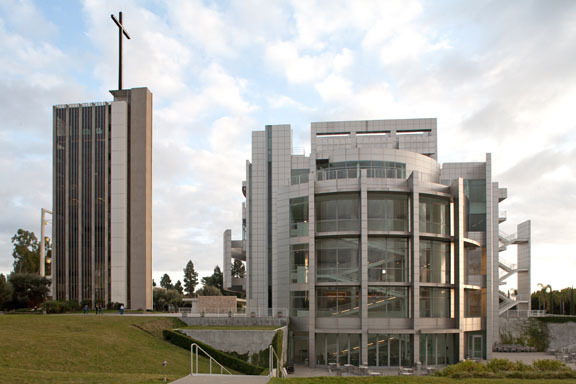 Recent financial difficulties at the church led to the sale of the complex to the Roman Catholic Diocese of Orange County , California, which will take possession of the property in 2015. 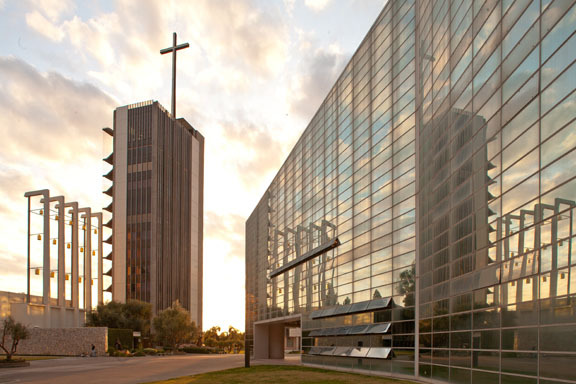 Fortunately for fans of Johnson’s ground-breaking design, the Diocese has no plans to change the exterior of the building. 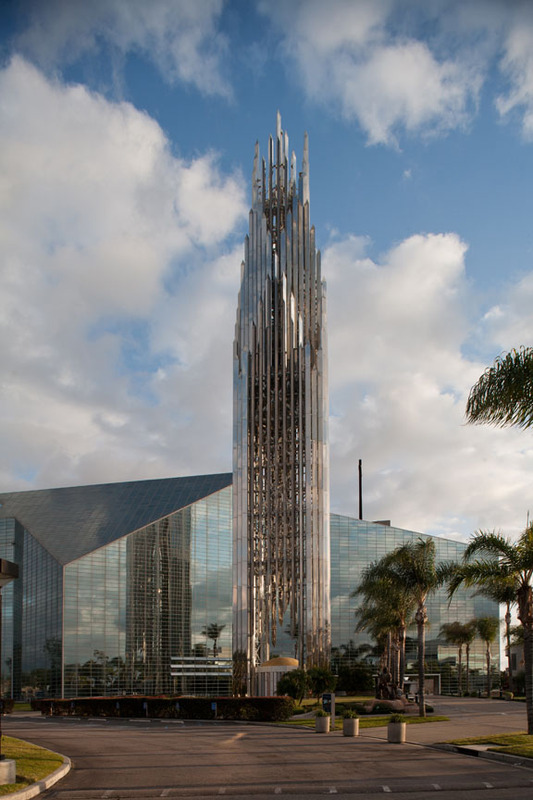 Although Johnson’s Crystal Cathedral, with its shiny stainless steel spire, defines the 30.9-acre church campus in Garden Grove, it is by no means the only building worthy of note. 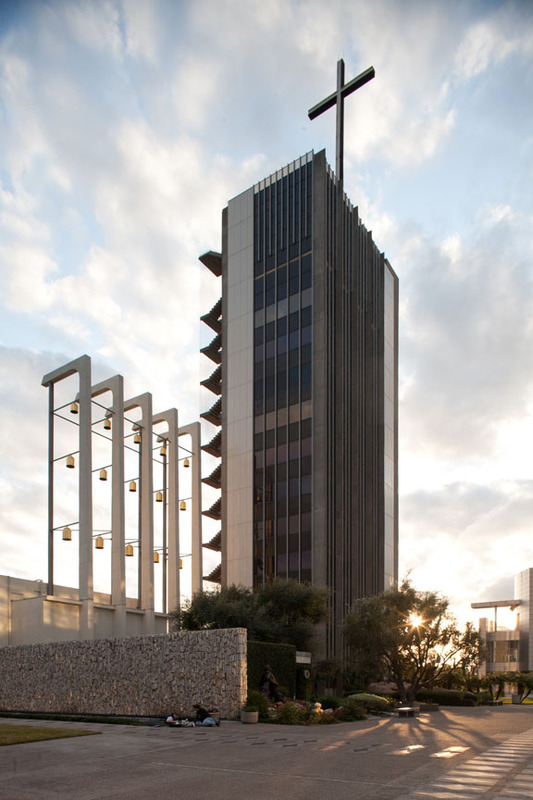 Neutra’s Tower of Hope is a delicate and perfectly scaled tower, featuring an elegant staircase ascending the entire southeastern corner. Atop sits a giant crucifix. 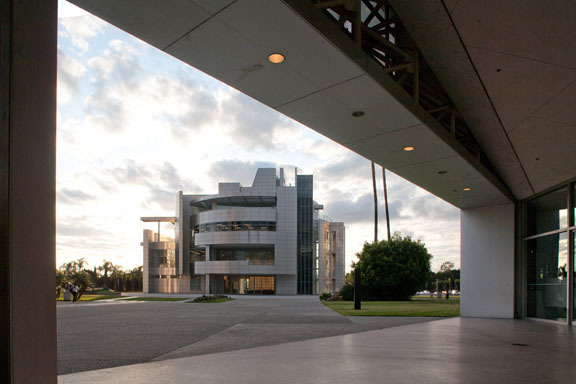 Meier’s International Center for Possibility Thinking was a later addition (2003) and, unusually for Meier, is not white but clothed in stainless steel. The interiors, however, are in white, and feature a 300-seat auditorium and a café situated in a sunken plaza on the lower level. 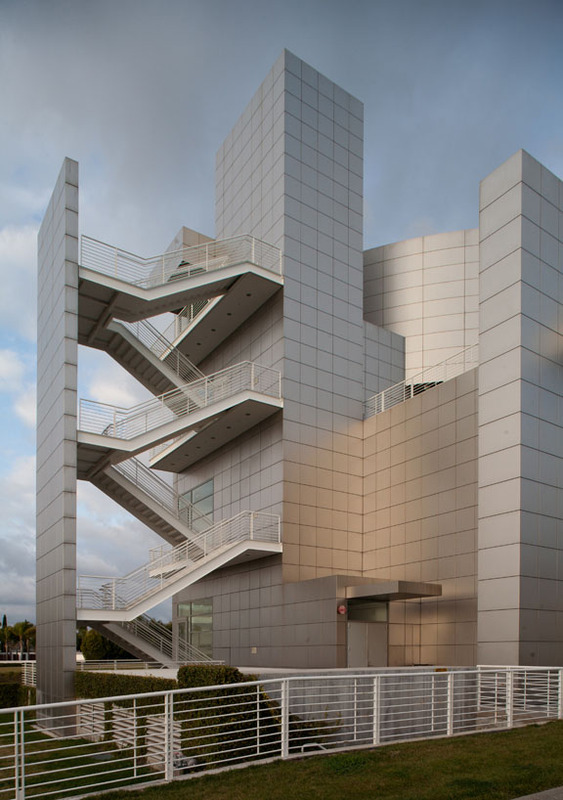 Abundant natural light filters through the building, which acts as the visitor’s center for the entire complex. 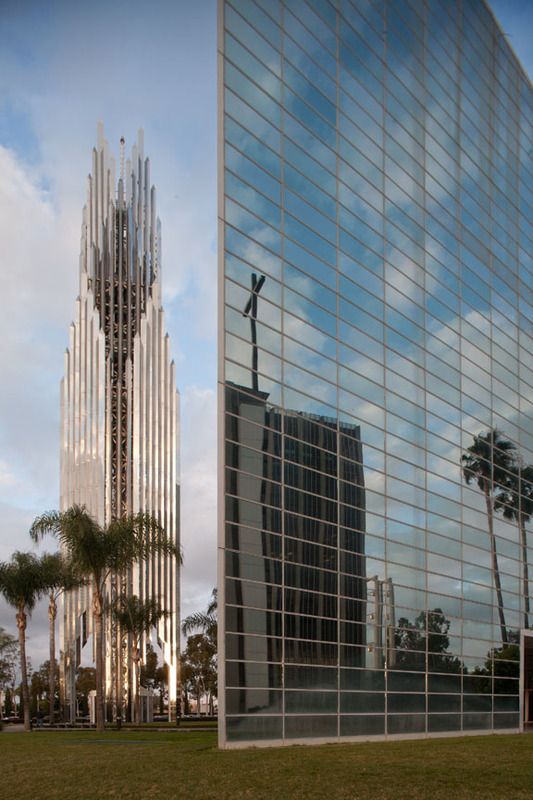 The Crystal Cathedral is one of Johnson’s seminal architectural projects; with its uncertain future now settled, fans of unusual religious architecture can continue to place this unique destination on their bucket lists.